Control joints act like perforations in paper. Making a concrete slab may seem as easy as pouring concrete into a big rectangular form. However, settling, shrinking, freezing and other factors can strain and crack the concrete. Concrete joints are used to minimize ugly cracks, simplify concrete projects and allow parts of the slab to move independently. Learn more about the 3 types of concrete joints -- expansion, control, and construction. Expansion joints, also known as isolation joints, completely separate two sections of concrete slab. They are typically strips of bituminous felt, but can also be made of wood, cork, rubber or plastic foam. The joints allow each section to move independently -- both vertically and horizontally -- as the concrete freezes and thaws, or undergoes soil shifting and other movement. Expansion joints should be the first joints planned and installed for a concrete project. They are particularly important at the edges of a new concrete project, such as the border where the new driveway meets a sidewalk with different concrete and conditions. They have a plastic cap that should be flush with the top of the concrete. After the concrete sets, remove the cap and add protective joint sealant. Control joints, also known as contraction joints, are basically intentional cracks in a concrete slab. They act much like perforations in paper, preventing messy, jagged rips. When the concrete expands or contracts, it will hopefully move and crack along the control joints instead of making ugly jagged cracks in the slab. Concrete saws or specialized groover tools are used to create a weak line across the slab. 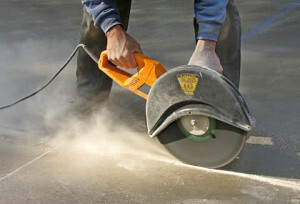 For small residential projects, a large concrete saw is not necessary. Instead, simply snap a chalk line and run a groover along the straight edge. Control joints should be placed 12 to 15 feet apart, and should extend down to at least one quarter of the slab’s thickness. Rule of thumb: multiply the thickness of the concrete by 2.5. That number, in feet, is the maximum appropriate distance between control joints. Construction joints provide internal framing for a concrete slab at the edges between different forms or between two pieces set on consecutive days. Construction joints typically consist of barriers made of plastic, wood, steel or preformed concrete, with a mechanism to hold the concrete in place. The two pieces of concrete may be keyed with male and female slots on the ends, or held together with dowels. For aesthetics and better reinforcement, construction joints should always be carefully planned. A well-planned construction joint may serve a double purpose as a control joint. They are sometimes placed at the last minute by necessity because of weather or a machine breakdown. Still, think ahead while pouring your slab to choose a spot where a contraction joint may be effective. Large concrete slabs may require contraction, construction and expansion joints at various spots in the concrete. Know the difference and plan your project well to avoid ugly cracks and other problems. For successful largescale projects, hire a professional concrete contractor.